Cyndi Steinke, program manager for Group/Water Fitness at the Andover Y suggests that doing strength work two to three times a week is a good general guideline—with rest or cross-training days in between. This straightforward class focuses more on front-to-back, traditional strength moves set to energetic music. With a predictable set of moves, your body can quickly learn to understand the movements and proper lifting techniques. Get a taste for this class in a short video. This class combines traditional strength exercises with training moves that mimic the functional tasks we do in everyday life. Class focuses on high-rep training and athletic movements to get results—all set to motivating music. See this class in action. Cyndi says that both classes offer a good way to learn how to lift weights in a safe way, with a trained professional watching to offer you cues. In either class, you determine how hard you want to work by choosing the weights appropriate for your workout. 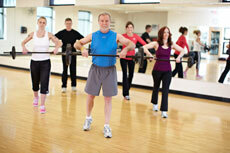 Find a class at your local Y to try something new!